In the Navy unmanned vehicles constitute four types of vehicles which operate in aerial, surface-land, surface-sea and underwater environments. Even though more glamorous terms like ‘autonomous vehicles’ are used to describe them, in reality, all these vehicles fall in the category of remotely controlled/piloted robotic vehicles. However, it is also true that in most of these categories, higher and higher degree of autonomous functioning can be built-in with the available technology. The question that arises before the Indian Navy is whether it is ready to go for development of autonomous unmanned systems, which would be cable of engaging a target and inflicting lethal damage on their own? Is the Indian Navy willing to develop technologies that empower the vehicle with embedded artificial intelligence to make the final decision to launch weapons at the target independent of any human intervention? It may be worthwhile to look at some innovative technologies, which are going to have a profound effect upon weaponised unmanned vehicles of tomorrow. Whereas artificial intelligence would enable an unmanned vehicle to perceive and respond to its changing environment, the cutting edge AI would enable the unmanned vehicle to learn automatically by assimilating large volumes of environmental and tactical information. 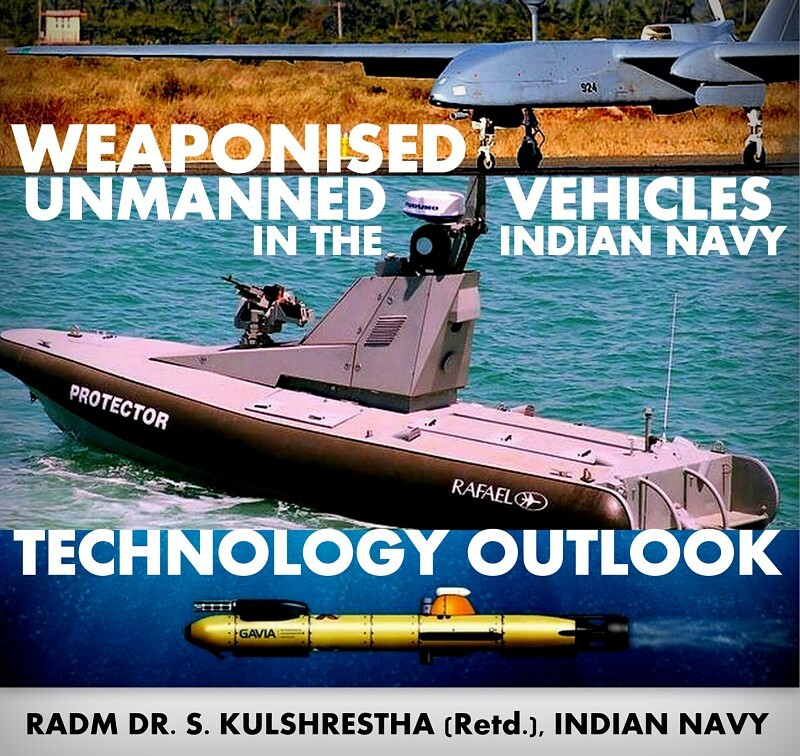 There is a need for the Indian Navy to look in to technologies and software formulations which would permit an unmanned vehicle, for example, to launch itself, proceed to learn acoustic, magnetic or electromagnetic signatures and identify the target on its own (as distinct from current weapons like mines, torpedoes and missiles which have a tested and tried inbuilt code). The need to pursue technologies that would enable it to go a step further by taking a decision to launch its weapons could be looked at in future. There is a definite need to look into Profound or / Deep learning technological issues since for most of the areas of their operations, unmanned vehicles would be required to accumulate vast amounts of data/ intelligence inputs from the surroundings, process it and upload it to systems for decision making by humans. Fundamentally, advanced algorithms need to be developed for unmanned vehicles through which the vehicle on its own can differentiate changes from the normal that need to be highlighted for predicting a future course of events by the analysts. Since Unmanned underwater vehicles would operational for periods extending over months at a time,one area of importance could be to make the vehicle unlearn (specific areas it has self-written the codes for), since it occupies memory space or it may no longer remain relevant. As the Unmanned systems race to achieve higher and higher levels of autonomous operations, there is a need to look into technologies, which would make unmanned vehicles more environmental friendly, like the use of green plastics of the poly hexahydrotriazines or PHTs category, which provide the same strength but are biodegradable. Similar advances need to be explored for providing the unmanned vehicles with green electrical power and its storage for long endurance operations. Neuromorphic Technology. Neuromorphic chips are designed to process information by mimicking human brain’s architecture resulting in massive computing and processing power. These combine data storage and data processing components in same interconnected modules thus providing power as well as energy efficiency. Satellites are not the only pathway for reliable communications, be it for data, voice, or command & control. There is a requirement for a resilient architecture that can act as a redundant pathway to atmospheric communications (including underwater) through electromagnetic domains including digital communications utilizing fiber domain. Fiber carries far larger bandwidth than what can be carried through the satellite systems. Multiple pathways would provide greater safety and protection to the cyber networks. Technologies need to be developed, to make the network physically resilient to deal with High Altitude Electromagnetic Pulse (HEMP), and to make the network react by itself to tampering by external actors. Distributed manufacturing enables efficient use of resources, with less wasted capacity in centralized factories. It also reduces the amount of capital required to build the first prototypes and products. Further, it limits the overall environmental impact of manufacturing since digital information is transferred over the internet with local sourcing of raw materials. However, Additive manufacturing poses a potentially disruptive challenge to conventional processes and supply chains. Its nascent applications in aerospace sectors need to be developed for the unmanned systems across the Naval unmanned requirement. There is a need to examine and develop 3D printing of circuit boards and other integrated electronic components. Currently, Nano scale component integration into 3D printing is a formidable challenge for this technology. Taking a step further, adaptive-additive technologies (4D printing) would be ushering in products that would be responsive to the natural environment (like temperature and humidity) around them. Test and evaluation of collaborative (Humans and robotic) systems is a big technological leap that needs to be addressed at the earliest. As of now, there is no software, which can test a collaborative system both physically, and intellectually, once an unmanned system has been tasked to learn on its own, it should have the capability to convey the extent of its learning as it progresses in its knowledge acquisition process. Navy needs to delve into cognitive testing aspects of software for unmanned vehicles today to fruitfully operate autonomous vehicles of tomorrow. Autonomous vehicles have ushered in a paradigm shift from the few big, expensive, and lethal weapons to large numbers of small, cheap, and smart unmanned systems capable of swarming the adversary. The unmanned vehicles today can carry significant amounts of weapons utilizing new designs of weapons with nano materials. The Navy needs to explore technologies for developing new types of weapons for use in the autonomous vehicles. Finally, the Indian Navy has to focus in the coming years on the technology developments in the commercial sector which have outpaced the developments in the military; especially in the software; and the artificial intelligence sector. It has to seek ways and means to synergize the commercial sector developments such that it can become a force multiplier ushering in the next RMA. The author RADM Dr. S. Kulshrestha (Retd. ), INDIAN NAVY, holds expertise in quality assurance of naval armament and ammunition. He is an alumnus of the National Defence College and a PhD from Jawaharlal Nehru University. He superannuated from the post of Director General Naval Armament Inspection in 2011. He is unaffiliated and writes in defence journals on issues related to Armament technology and indigenisation.